In this article I’m going to review the 2017 sets of the Lego Speed Champions series. 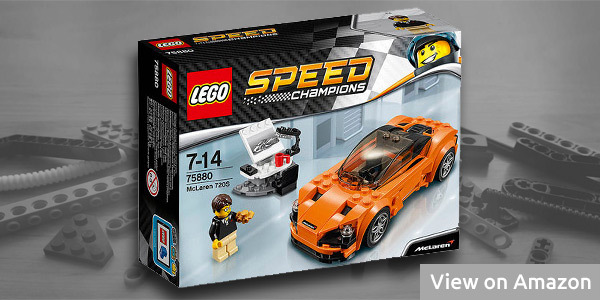 The Speed Champions Lego category is becoming really popular with the new sets that were released in 2017, for example, Bugatti Chiron, McLaren 720S or Mercedes AMG GT. These 3 supercars are really popular now and Lego has released them under the license of these carmakers. Now I will try to review these Lego sets briefly. So let’s move on to the reviews. 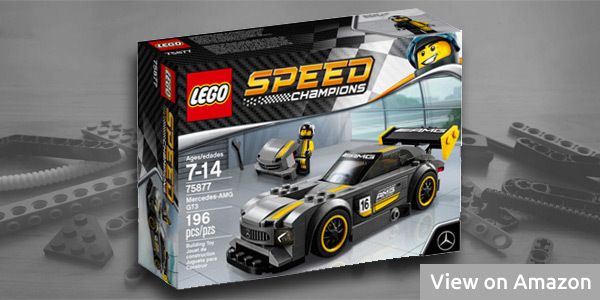 The first one on my list is the Mercedes-AMG GT3 supercar Lego set. The model consists of 196 pieces and most of them are of the gray, black and yellow color. This Lego set is officially licensed by the Mercedes-Benz company. 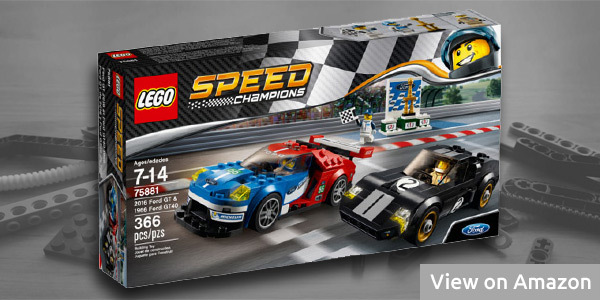 The set features some styling racing yellow stickers and it contains one minifigure. Accessories include a wrench, second set of rims and an alternative front bumper. This Lego set is recommended for the kids of the age 7 – 14 years. The second set on this list is a Lego model of the fastest series production supercar Bugatti Chiron. I personally bought this set and took some time to prepare a little more detailed review of it. 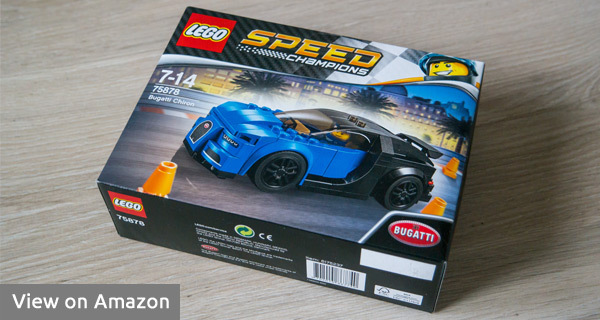 So to find out more details about this set and see some photos of my final model and the packaging as well, check out my review of this set over here: Lego Bugatti Chiron Review. Another one on my list is not a series production model, but a Ferrari Formula 1 set. Most of the parts of this set are of the red, white and black color. And what is interesting to mention about this set is that it contains 29 stickers in total. Well, it is a Formula One model and the racing Formulas usually have a lot of stickers. 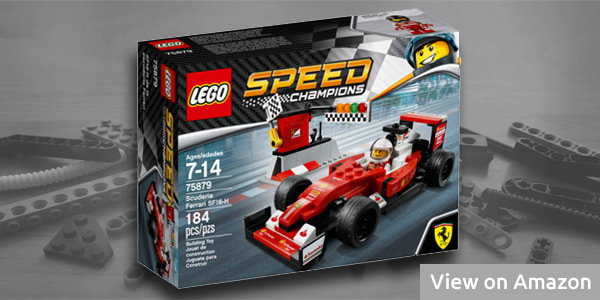 The minifigure that is included features the 2016 Ferrari team Formula drivers Kimi Raikkonen and Sebastian Vettel. This set is ideal for the kids of the age 7 – 14 years. Although there already are images of this set, it has not been officially released yet. So it’s not currently possible to purchase it. I will update this post when it becomes available. However, one thing that we can say already about this set is that it is a little different from the rest of the sets in this list. And it is because instead of an alternative bumper or roadwork cones this set includes a designer’s desk. This set contains two car models, the 2016 Ford GT and the 1966 Ford GT40. The set contains 366 pieces in total and they are divided into two bags. One for the 2016 model and the other one for the 1966 model. The set contains 3 minifigures and also includes a podium and trophy for the winners (the drivers). The set is recommended for the kids of the age 7 to 14 years old. 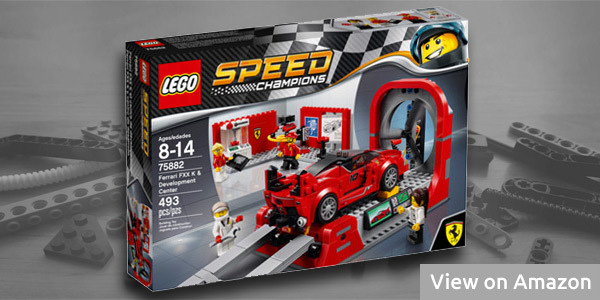 This set contains the Ferrari FXX K model and a development center with 4 minifigures. It contains 494 pieces in total, what makes this set a bigger one than the previous ones mentioned in this list. Most of the parts are of the red, gray and black color. 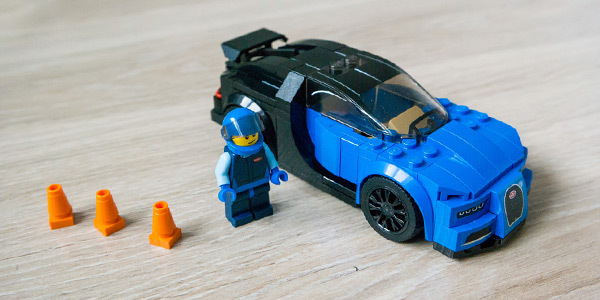 The driver minifigure can be placed inside the car as well. The development center contains an engine test area and a 3D printer. It also includes a whiteboard with a design sketch of the Ferrari model. If you are interested particularly in Ferrari Lego models, you might like to check my other article Lego Technic Ferrari sets in which I reviewed the Lego Technic Ferrari sets. The last set on my list is also the biggest one with 941 pieces in total. This set has the highest number of minifigures as well, 8 in total (2 team drivers, 2 engineers, team manager, cameraman, race fan and a fast food vendor). It is the set of the Mercedes AMG Petronas Formula 1 Team. 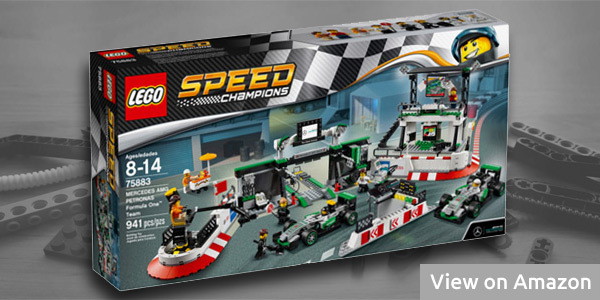 Besides the two Mercedes Formula 1 race cars, this set also includes a pit garage, pit wall and a grandstand. Also, if you are interested in Formula 1 Lego sets, check out my other article about Lego Formula 1 sets in which I reviewed the bigger Formula 1 Lego sets.